If you want to know anything about home or commercial vacuum cleaners, ask Martha. She can explain all the features of Oreck and Simplicity vacs and help you make an informed decision in selecting the best choices for your home care needs. Martha has been with the store for 14 years and keeps the "home fires burning" during store hours. 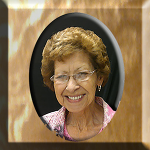 A native of North Carolina, she has lived in the Bryan/Stryker area for 49 years..